Yorkshire Water in partnership with Black & Veatch had to increase the capacity of the Lagoon, and construct a new slipway adjacent the River Hull to reduce the effect of flooding to nearby residential properties. The works had to be carried out in such a way as to cause minimal disruption to local residents and wildlife. To install 1376 sheet piles of various lengths up to 10m long with a Japanese manufactured Kowan machine which is silent and vibration free and capable of pushing a maximum of 150t. A total of 1100 tonne of Tokyo Steel- Sheet piles were transported along the M62 from Dew’s stock yard near Manchester and installed within a 16 week programme utilising cranes from FKL Plant. 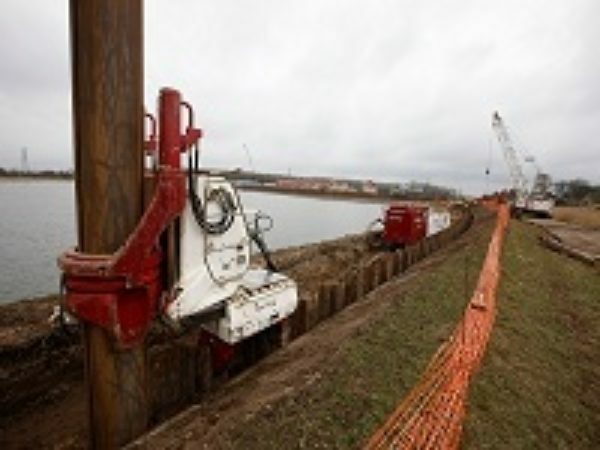 Access was particularly tight at certain points on the lagoon so Dew supplied temporary roadways using hardwood timber mats and specialist telescopic mini-cranes were used to service the Kowan Press.